The act of putting to death by nailing or binding to a cross. Among the modes of Capital Punishment known to the Jewish penal law, crucifixion is not found; the "hanging" of criminals "on a tree," mentioned in Deut. xxi. 22, was resorted to in New Testament times only after lapidation (Sanh. vi. 4; Sifre, ii. 221, ed. Friedmann, Vienna, 1864). 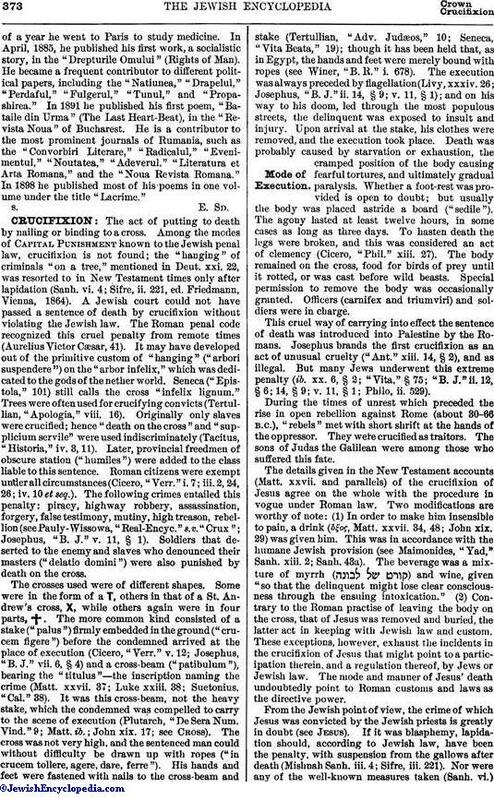 A Jewish court could not have passed a sentence of death by crucifixion without violating the Jewish law. The Roman penal code recognized this cruel penalty from remote times (Aurelius Victor Cæsar, 41). It may have developed out of the primitive custom of "hanging" ("arbori suspendere") on the "arbor infelix," which was dedicated to the gods of the nether world. Seneca ("Epistola," 101) still calls the cross "infelix lignum." Trees were often used for crucifying convicts (Tertullian, "Apologia," viii. 16). Originally only slaves were crucified; hence "death on the cross" and "supplicium servile" were used indiscriminately (Tacitus, "Historia," iv. 3, 11). Later, provincial freedmen of obscure station ("humiles") were added to the class liable to this sentence. Roman citizens were exempt under all circumstances (Cicero, "Verr." i. 7; iii. 2, 24, 26; iv. 10 et seq.). The following crimes entailed this penalty: piracy, highway robbery, assassination, forgery, false testimony, mutiny, high treason, rebellion (see Pauly-Wissowa, "Real-Encyc." s.v. "Crux"; Josephus, "B. J." v. 11, § 1). Soldiers that deserted to the enemy and slaves who denounced their masters ("delatio domini")were also punished by death on the cross. The details given in the New Testament accounts (Matt. xxvii. and parallels) of the crucifixion of Jesus agree on the whole with the procedure in vogue under Roman law. Two modifications are worthy of note: (1) In order to make him insensible to pain, a drink (ὁξος, Matt. xxvii. 34, 48; John xix. 29) was given him. This was in accordance with the humane Jewish provision (see Maimonides, "Yad," Sanh. xiii. 2; Sanh. 43a). The beverage was a mixture of myrrh ( ) and wine, given "so that the delinquent might lose clear consciousness through the ensuing intoxication." (2) Contrary to the Roman practise of leaving the body on the cross, that of Jesus was removed and buried, the latter act in keeping with Jewish law and custom. These exceptions, however, exhaust the incidents in the crucifixion of Jesus that might point to a participation therein, and a regulation thereof, by Jews or Jewish law. The mode and manner of Jesus' death undoubtedly point to Roman customs and laws as the directive power. The greatest difficulty from the point of view of the Jewish penal procedure is presented by the day and time of the execution. According to the Gospels, Jesus died on Friday, the eve of Sabbath. Yet on that day, in view of the approach of the Sabbath (or holiday), executions lasting until late in the afternoon were almost impossible (Sifre, ii. 221; Sanh. 35b; Mekilta to Wayaḳhel). The Synoptics do not agree with John on the date of the month. According to the latter he died on the 14th of Nisan, as though he were the paschal lamb; but executions were certainly not regular on the eve of a Jewish holiday. According to the Synoptics, the date of his death was the 15th of Nisan (first day of Passover), when again no execution could be held (Mishnah Sanh. iv. 1; and the commentaries: Yer. Sanh. ii. 3; Yer. Beẓ. v. 2; Ket. i. 1). This discrepancy has given rise to various attempts at rectification. That by Chwolson is the most ingenious, assuming that Jesus died on the 14th, and accounting for the error in Matthew by a mistranslation from the original Hebrew in Matt. xxvi. 17 ( , due to the omission of the first ; see his "Das Letzte Passamahl Christi," p. 13). 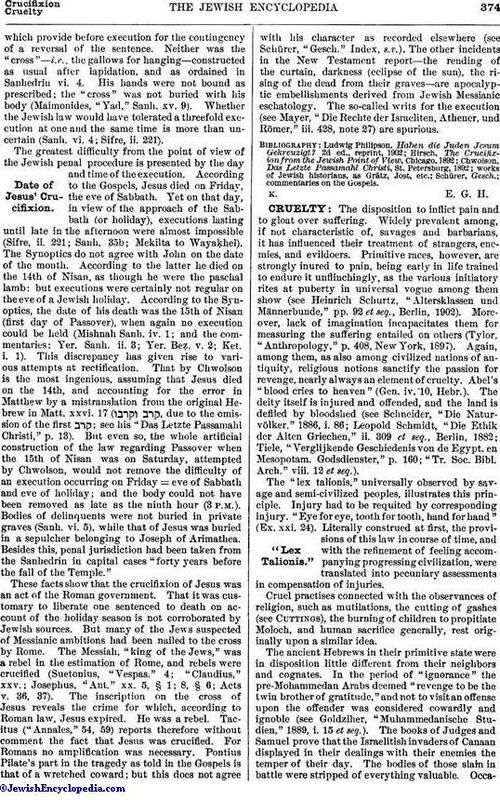 But even so, the whole artificial construction of the law regarding Passover when the 15th of Nisan was on Saturday, attempted by Chwolson, would not remove the difficulty of an execution occurring on Friday = eve of Sabbath and eve of holiday; and the body could not have been removed as late as the ninth hour (3 P. M.). Bodies of delinquents were not buried in private graves (Sanh. vi. 5), while that of Jesus was buried in a sepulcher belonging to Joseph of Arimathea. Besides this, penal jurisdiction had been taken from the Sanhedrin in capital cases "forty years before the fall of the Temple."